BPR AZ is a assembling A Crew of Total FREAK JOBS… just the way we like it. The newest application arrived at BPR AZ headquarters and was quickly sent to The BPR Supreme Council for review. Interesting s*^t going on over in Arizona. That’s right, interesting. 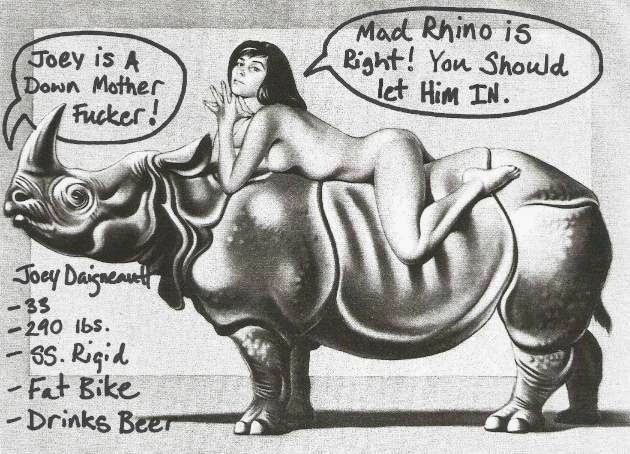 Mad Rhino and the BPR AZ dudes are building a big a$$ crew in Arizona. (Yeah, Big A$$.) I’m think’n this 290 lbs dude that rides a rigid SS in is. Yeah, 290lbs. This Joey D dude will pound the Cheetos Burritos with The Judd. I’m guess’n. BTW, anyone know how we can get this foxy mama in The Crew? I think I pulled the photo off of 616 or FatBikes.com. Doesn’t matter. I can’t be sued. The f’n government is shut down.